We have a bit of a kitchen knife fetish. It is arguably the most important piece of equipment in the kitchen, and a good one in some practiced hands is truly an amazing thing. Historically, we have been partial to Global Knives, as we like that high carbon steel which has a razor light edge and is light in the hand. However, we do covet Shun Premiere Series with hammered finish...but we digress. 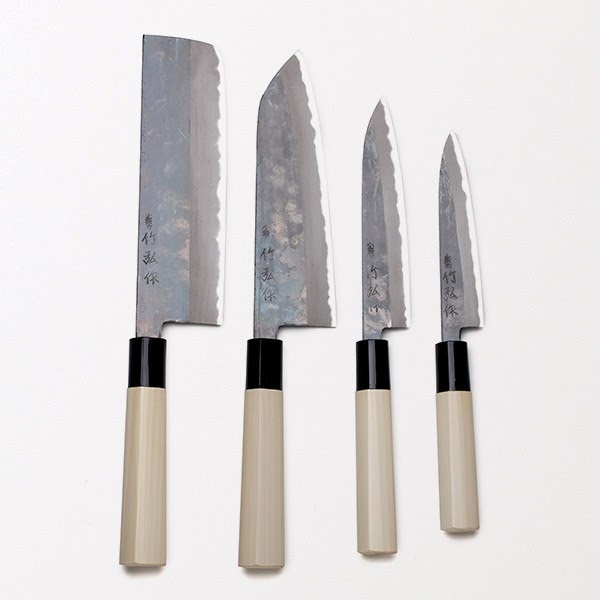 The newest objects of our affection is the Toshiki Kitchen Knives, crafted by Toshiki Nambu exclusively for Best Made Co. The 71 year old Japanese forge uses high content white carbon steel and magnolia handles to make a knife renowned for their edge retention and superior balance, and the above set (Nakiri, Santoku, Petty, and Paring) will become the new work horses in your kitchen. You can see and learn more here. very much interesting article about kitchen appliances. very much interesting article about knives. This Article is very much informative keep sharing. Interesting and very much informative article. thanks for sharing. This article contains a lot of information for all kitchen loving peoples. Bulk SMS is the ideal answer for provoke your business administrations and items. A considerable lot of the organizations are sending Bulk SMS to India, it might be a value-based instant message or limited time. Amazing information. Thanks for sharing this helpful article. good information to read through.